Enfield Scuba and Water Sports is a dive shop near Springfield, Massachusetts that sells equipment, teaches scuba lessons, and organizes group tours for divers to travel to dive spots around the world. If you’ve ever been curious about scuba, they are experts who can tell you everything. 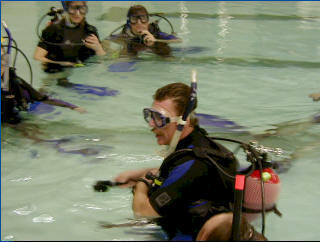 They train using the method from PADI, the world’s largest diving organization. 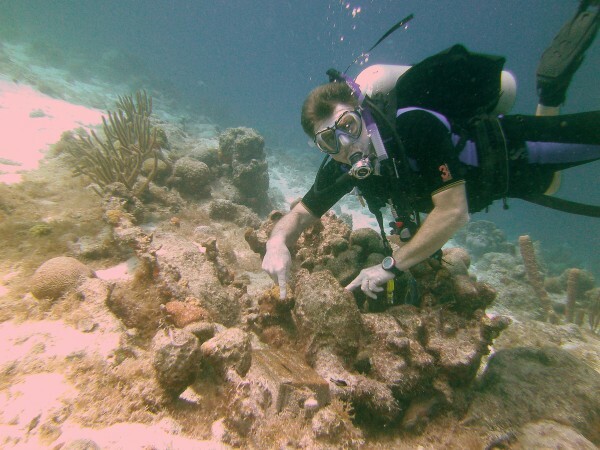 Why care about scuba? It’s a unique experience to go underwater, and feels even more like exploring an exotic world than hiking into the wildnerness, while taking far less time. Floating weightless is surprisingly easy even if you’re not athletic. Your fins help you swim quickly, and you’re mainly just going up and down. It takes less effort than skiing or a ropes course. But it looks like you’re a superhero in your photos, making scuba the perfect sport. It gives you more to do when you’re on vacation, and there’s plenty of diving just here in New England. For example, now that I’m scuba certified, I look forward to going “cage diving”, which is when they place you in a cage and throw chum in the water to attract sharks. We were told that scuba is a community and you meet great people, too. Ultimately, I was glad to get scuba certified, but there’s a lot more to it than you might expect. You must go through book learning, watch a video, and take some tests, which is three or four days of serious study. Then you go for two or three days of “confined water dive” lessons (technically there are 5 of these lessons), meaning scuba diving in a safe environment such as an indoor pool. Finally, you go on two days of “open water dive” lessons (technically there are 4 of them) in an actual ocean. The scuba doesn’t get fun until you’re in your first open water dive, so there’s a big act of faith to invest money and time into the book learning and confined diving. This is unlike many forms of training. For example, if you’re learning to dance, you have fun dancing a little even during your first lesson. With scuba, for safety’s sake, you won’t be having fun until quite far into the process. Enfield Scuba kindly allowed a press review of our book test and confined dives, and then we went off on vacation to get our open water dives elsewhere. Enfield Scuba has a small but impressive dive shop, and staff were knowledgeable and supportive. Miraculously, they were available on short notice even during the holiday break as our overseas vacation approached, which none of the dive shops closer to Boston were. That is superior service, and they rescued our trip. Without them, because of safety, we would not have been allowed to do any open water dives over the holidays. The masks and fins that Enfield Scuba sold us were inexpensive and higher quality than the loaners we were offers by scuba tours overseas. They took the time to explain the entire process. You can train with Enfield Scuba as part of a large group, or through private lessons, which gets you through more quickly. Although we were told that students sometimes go through all their confined water lessons in a single night, that seems impossible for a group of two or more. Instead we did our “five” confined water lessons through two long nights of private training with two different instructors. We were able to do the book learning on our own, so our first instructor needed only to give us a short overview of the material. Learning to scuba is about as hard as learning to drive. The PADI video and books are almost absurdly simplified and accessible to a student of any ability. The courses have plenty of repetition so that you don’t forget the basics. For someone like me, who wants to stick to amateur diving, scuba is dangerous enough to take seriously, but not dangerous enough to be dangerous. Training is mainly about just getting comfortable being underwater without freaking out. You learn a lot of emergency skills, which you should never need if you’re renting equipment from and being led by a reputable tour operator. Once you are scuba certified, that is good for life, although PADI does offer re-education and other advanced dive courses. Our first instructor gave us great empathy and support during the book work tests, which were time-consuming, but easy. Students don’t even need that high a score on the tests to pass, because you’ll be practicing everything one the book learning is gone. Our instructor’s grading us was more about finding opportunities to learn than judging us. Pro tip: read through all five sections in the PADI book, even if you’re told to just read the first three. You are safe to speed read through the book because you can rely on the tiny PADI quizzes in the book to warn you about what you missed and should go back to read more carefully. 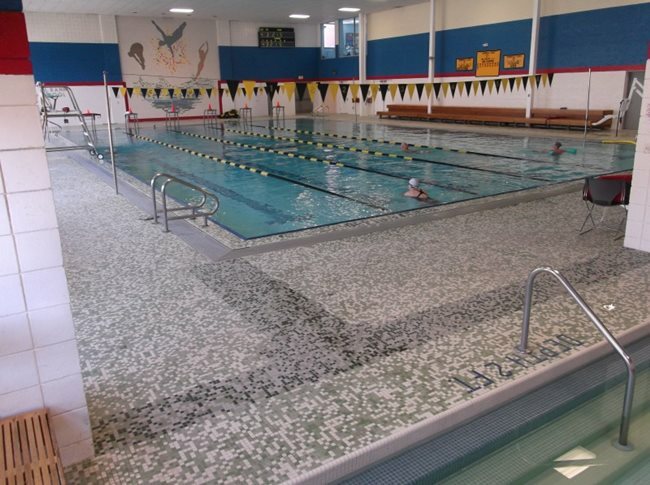 Then we went into the indoor pool at the Springfield Jewish Community Center, which is an impressive recreational center open to the general public. At the JCC, you’ll find a dance studio, gymnasium, racquetball and tennis courts, and more. You’ll also find a lot of old people surprisingly okay with standing around naked in the locker rooms, but I guess every local rec center has that. Also, the chlorinated water in a pool will sting your eyes, which does not seem like that big a deal, but becomes a big distraction if you are struggling to get used to all the equipment and being underwater. Your mask may leak accidentally, and part of the lessons involve removing and replacing your mask. So your eyes will feel raw. Pro tip: don’t wear contact lenses for a chlorinated pool lesson unless you have absolutely terrible vision. The JCC pool was colder than was comfortable, as well. It was a shame that our original masks didn’t fit well, and we felt a bit uncomfortable with the fins, which are awkward to stand with in shallow water. Although theoretically you could have fun in your confined dive lessons, these rough edges cut into the fun for us. It was only later that we learned that you can take confined dive scuba lessons at a beautiful, tropical public beach where the salt water is not as annoying as chlorinated water. Because you can stand up at any time in the shallow beach water, that’s considered safe enough to be a “confined” dive. However, we don’t regret getting our confined dives out of the way in cold winter New England before going overseas. That way, we burned two days in New England on training and only three days, not five, in the Caribbean. We did have some trouble with our equipment, but I believe it’s normal as you get properly sized and have the right weights added to your weight belt. We look the lessons mostly in shallow water, so that we could stand up at any time, but moved deep as needed. And we were grateful that our instructors took care of the setup and breakdown, although our first instructor arrived late. We did need to learn to assemble and wear our scuba equipment, but weren’t made to lug stuff out of the back room or wash anything. It was awkward sometimes having to share the pool with others not doing scuba, even in the same lane as us, especially when they came close to us. Both of our instructors were true experts who made us feel safe, and they never made us feel like we had to be macho. But we our first night instructor was more of an excellent experience (5 stars), and our second night instructor simply a good experience (4 stars). Our first instructor frequently asked whether we had questions, and was a better listener. When you teach hundreds of students, you get a sense for the common goofs and misconceptions that students have, and our first instructor seemed to more readily identify what we were doing wrong. Our second instructor was also good but had less of a read on our body language and offered less empathy to our apprehension. We found ourselves having to take control of problem solving at times. For example, when I was practicing removing my BCD (the scuba backpack) and replacing it while treading water, our second instructor asked me to buckle all the straps. One of the buckle strap end pairs didn’t reach; something was wrong with the length of the strap. When I said that it didn’t reach, our first instructor would have noticed that the BCD wasn’t sitting correctly on my back; our second just said, “Well, it fit before!”, putting the burden on me to ask a second time for help. Desperate students flailing in the water need more coddling than that. Later, when my guest was emotionally exhausted, and asked our second instructor for encouragement, it seemed to be a challenge for him to say something sufficiently empathetic or insightful. That was where she dropped out of the course. Don’t let these observations make you think that we had a poor experience! Our second instructor was safe and technically proficient, but just seemed less of a natural teacher. For example, we spent our first 15 minutes of our second class going through rapid fire instructions about everything we’d be learning that evening. No student could possibly have followed all of that. Students need time to take it in and reflect on what they’ve just heard. Also, the big information dump scared us, talking about the advanced stuff before we had mastered the easier stuff. Later, we should have had more time to get used to our fins before performing a task that combined snorkel, regulator, and fins all at once. Overall, learning scuba was more time-consuming but easier than we expected. Breathing underwater without panic, and even learning the emergency procedure where you share an air hose with your buddy, was no big deal for me and even for my less water-experienced guest. That being said, you really shouldn’t begin PADI instruction unless you are a moderately strong swimmer. If you can’t tread water effortlessly and endlessly, you’ll have difficulty treading water while simultaneously thinking about safety and performing all the scuba tasks. And you’ll need to complete an uninterrupted 200m swim to finish your confined dive. Ultimately my guest was just not ready with basic swimming for our scuba lessons, but for me, with more swimming experience and comfort in the water, ultimately I did get all the way to scuba certification and was glad that I did. With an excellent experience at the dive shop, an excellent first instruction, and a solid but not ideal second instruction, and an acceptable pool location that was slightly too cold and perhaps should have been a Caribbean beach, I’m pleased to give Enfield Scuba 4.5 stars.